It was only a matter of time before this happened. IGN has revealed that, beginning in February 2014, Archie Comics will adapt the Mega Man X storyline. Before you jump for joy, know that this is NOT a new monthly series. Rather, the Mega Man X story will be depicted within the pages of the current Mega Man comic as a back-up story beginning in issue #34. As for the prospect of X getting his own set of comics, Archie's Ian Flynn says it's a possability. "We really want to bring people a Mega Man X book, so we need the people to demand it. Be passionate and be loud, people!" Flynn promises the back-up adaption will stick true to the game's continuity. Matter of fact, the first stories will chart the months leading up to Sigma's bloody revolution. Sweet! Really looking forward to this. This is going to be interesting. I'm glad to hear this after a few weeks of finally subscribing to the books. God no. Leave Mega Man X alone. I don't like anything Archie has done with the license. If you don't have an interest in the Archie comic, then why do you care? There's plenty of us that enjoy it. I'll never understand the logic of "I don't like it, so nobody else should be allowed to have it." It's very simple to understand actually. You love something, you don't wanna see bad things happen to it. See easy. True. But some's definition of "bad things" can be really pity. So I guess we're getting "Day of Sigma" adaptation as a backup before Archie can commit to a MMX series? I suppose I'm ok with that. Is it too much to ask for them to have Spaziante draw this bakup feature? I don't think it's too much to ask for, because it's already been confirmed that he's the one drawing it. I liked first series of Megaman with first artist and nice drawing but.... later next artist replace and it look horrible. No more! Definitely on my watch list! They better bring their A-game, maybe hire GOOD sci-fi writers from outside the company. NOOOOO! Please Archie don't touch MMX, please I'm begging YOOOU! What a crap time to be a Mega Man fan. If you don't like it, don't buy it. But let those of us that actually like the Archie comic to enjoy it. Oh lovely pages are going to be cut out of the already rushed regular Mega Man comic to make room for this. Glad I didn't bother to renew my subscription at the end of the second year, it's pretty clear Archie's more interested in fandom bait than actually telling a good story. Aaaand out come the trollbait responses, right on cue. Basically another illustration of why this fandom can't have nice things. If you don't like it, don't read it. Spare us all the insufferable whining. Whiners gonna whine, I'm hyped. I hope in like say 2-3 years (Or at least when they get X2 done) they make a 'Days of Future's past' style crossover with the classic!!! No. No. No. No. No. Also, no. I don't feel a strong urge to see this anon's suggestion happen because I don't really see much of any interest coming out of it. If an X series comic isn't going to hash out what happened that caused the world to change beyond the game canon; why should a time travel crossover? Add to that much of the X and Classic series dynamic is the same; far more homogenous than Mega Man and Sonic. So it's not like the character interactions would be worth seeing, and there's not really much potential for transserial intrigue with X and company going backwards in the world history, and tech curve. And if the interest is in Sigma and Wily pulling out all the stops to stop a combined hero team; I'm more put off there were stops to begin with. But Joe; I don't see how you can possibly be applauding including World 2 and RM&B2 into Archie's foreshadowing; then turn around and say Archie would lose any credibility they have if they do anything with that device. Those outsourced games' scarce plots have two of the most convoluted, circular, and impotent time travel plots possible. Ones the game canon has tried quite hard to live down. I seriously can't imagine Archie's going to explore those games' plots without tampering with them. At least enough so they don't write Mega Man's and possibly the whole world's obituary. Well, my anonymous friend, I can applaud Archie tossing Wily Tower, Rockman World 2, and Rockman & Forte 2 in that time travel episode because, quite simply, the games themselves were written in such a way as to not screw with the overall continuity of the series. 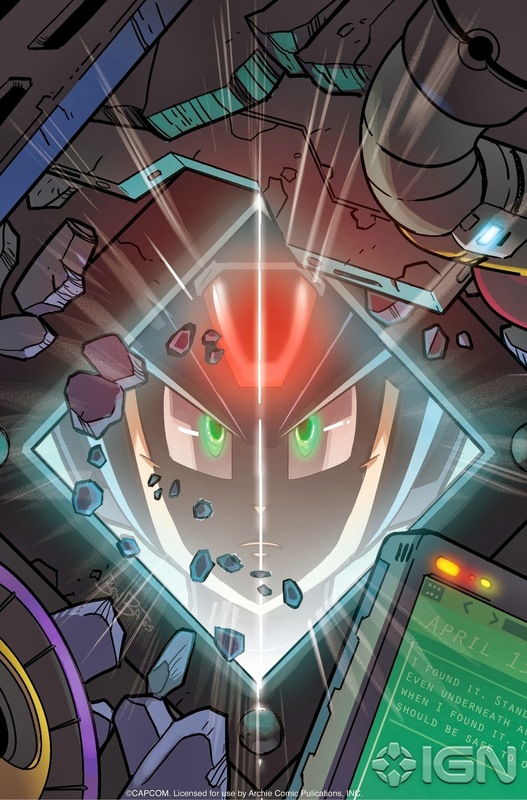 Quint comes from either an exact future that Rock has yet to encounter, or an alternate future where he wouldn't be expecting Wily to double-cross him. Given that Dr. Light fell for Wily's (or someone else's) schemes no less than five times in the course of the main classic series (3, 5, 7, Rockman & Forte, 10), It'd not outside of the realm of possibility that Rock would do the same in the future or an alternate future. Rockman Shadow also comes from an alternate future, in a manner of speaking. Though he claimed to be Quint at one point, he eventually confessed and admitted Dr. Wily made him as a "prototype" before ultimately deciding to just brainwash future Rock. Shortly after, R-Shadow devastated his own timeline's world to prove to Wily he was the strongest. Since Rock was no longer there, no one could stop him. So, he went back in time (presumably with Wily's old Time Skimmer...?) to fight Rockman and Forte. But anyway, this ultimately had about as much of an impact on the classic series' plot as any Dragon Ball Z movie has on the anime, though it fits in perfectly fine anywhere between Rockman & Forte and the great mystery time before 21XX. If Archie were to try and explain what happened between those two time periods, it would lead to yet another great divide between the fandom. Chances are, they would go off one fan theory or another, or even worse, write their own theory that ignores all the facts. No one explanation would be sufficient, given the inconsistencies placed in the class and X series, as well as the inconsistent amount of time that passed between 20XX and 21XX. (At minimum, a couple decades; at maximum, 100 years or more from 2014 -- if Dr. Cain's logs reading 2114 are accurate.) And that, as you said, would pretty much be the coffin and the final nail there in for Archie's Mega Man comics. BAAAH HA HA HA HA HA! I've never heard anything so absurd in my life! Thanks for the good laugh to close the night! I'll be glad to have a dream more believable than what's cooked in yours. Makes me think of the almost Mega Man X Dreamwave comic. Mega Man is fine in Archie Comics, but I can't imagine Mega Man X there. I mean, Mega Man is a good-hearted story, while MMX is darker. Maybe I'm wrong, but after what they did with Teenage Mutant Ninja Turtles I don't expect too much about this. It's funny because Archie's TMNT was awesome and quite dark at times. Many whiners are most likely the type that want the comics to be as faithful as possible to the games, with no original characters, crossover, and other stuff. Well, if ya want the game story, go play the game and stop whining. Even the games have different stories, see MM1/MMPU and MMX/MHX. I love me some X, but I don't Classic to be edged out. Let's have a second comic! A second comic would eat into the sales of the first so much it's cancellation would be guaranteed. Like why there were so few Classic games in the SNES-PSX-PS2 era. I don't like the idea of the over used cliche of a story involving time-travel/cross-overs. If they want to write MMX comics, just stick with MMX story only. Or try writing a story about what-if classic continued towards MMX. That would be nice. This is exactly the point where the Sonic comic started rotting: Knuckles side-comics. You should really back all this up in your files, because in the years to come (if this comic manages to continue it's run) you'll be AMAZED at how accurate my predictions are going to be. Why am I so sure of them? BECAUSE THEY'RE EXACTLY THE KIND OF IDEAS THAT SHOULD NOT BE APPLIED TO A MEGAMAN COMIC AND THEY'RE EXACTLY THE KIND OF IDEAS THAT IAN FLYNN GETS OFF ON! Actually, as someone who's read the Sonic comics since issue 0, I can say with absolute certainly you should be grateful this Mega Man series was not done at the same time as Sonic's because more than likely it also would have its issues hijacked to (what's the word they used to say?) serve as a backdoor pilot for the writer's pet project(s). Everything you've said is true EXCEPT for the fact the writer you named is WRONG. This is not being done by current writer Ian Flynn, but of the former writer Ken Penders who even now the effects of the recent lawsuit with Archie are having near irrevocable changes to Sonic The Hedgehog, changes that (contrary to what YOU believe) realigns it to be faithfully with the games, something which I'm personally disappointed in losing several favorite characters. However, because of the great lengths Ian has done to preserve the main crew that started with Sonic & Tails since the comic's beginning into the modern incarnation, I am willing to give the new direction a year-long chance and will continue to read in that time: If I've warmed up to it by then, I'll stay. Also, you should look up José Roberto Pereira, a writer for the Brazil Megaman comic that tried to do what Penders did but thankfully was stopped for. This would be great! I love the megaman comics as they are, but I always wished there would be a megaman x series. I want it to be it's own line of comics though. Just don't have a crossover with the classic megaman would be my only complaint. I won't really care about this issue unless it includes Zero. I hope it does not continue to spread the lies about X being a pacifist.